When we first started our ‘hobby’ farm we turned to Storey’s Guides as our first choice in all inclusive information to get us started. I recently have been curious about honey bees and how to start hives. I saw that Storey had a guide to honey bees and I was sure it would be a great read. I was enlightened again by the level of instruction and direction that this guide gave. Well described information for the beginner to ponder and think on before jumping into being a beekeeper. There is much more to beekeeping than I could ever imagine. The book began with an introduction for the beginner which I found very helpful. It then discussed the many interesting aspects of a honey bee and how to keep a hive. The book goes into many details that I would find useful if we were to start our own hives. It is not only a great beginner book, it delves into much detail for the experienced beekeeper to have on hand as a resource. My previous Storey Guides have been well used through the years as a book to use to find quick answers as well as helping others who may be new to the hobby. 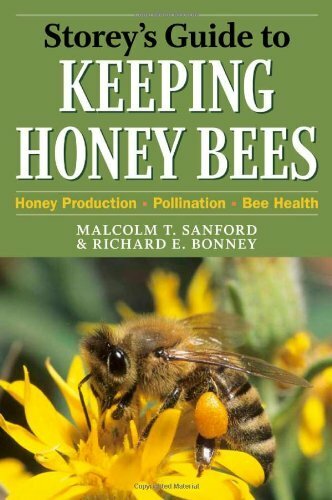 I will be using this book in the future as we continue to learn about the process of keeping honey bees. It references many other books, and online organizations that specialize in all things bees.